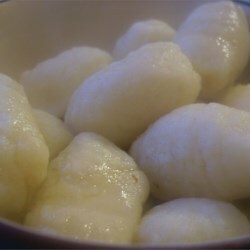 Make tender, delicious gnocchi using instant mashed potatoes to slash prep time. Blend egg, salt, pepper, flour and mashed potatoes into a dough, cut into bite -size pieces and cook in boiling water. Serve with the sauce of your choice.